VG Donut & Bakery is a full service bakery located in Cardiff-by-the-Sea, in Coastal North County San Diego. Specializing in the old-fashioned style of baking, VGs is owned and operated by the Mettee family since 1969, and is now a thriving third generation business. VG or “Very Good” for those who were wondering, is a local’s favorite for a fresh cup of coffee and a bakery item guaranteed to satisfy a sweet tooth. 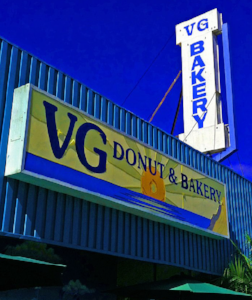 For many customers, VG Donut & Bakery has become a tradition and a Cardiff landmark. The quick moving line that extends out the doors daily is proof that VGs is more than a bakery, it’s an institution filled with familiar faces. VGs uses only top quality ingredients to ensure top quality products. Donuts are baked twice daily, at 4 a.m. and 4 p.m. We also offer a large variety of pastries, muffins, cookies, bread, desserts and cakes for all occasions, including weddings. In fact, VG Donut & Bakery makes the most reasonably priced and delicious wedding cakes in San Diego. During the holidays, VGs offers an extensive holiday ordering menu complete with festive desserts, traditional baked goods, cookies, pies, as well as bread and rolls. Yes, you’ve heard VG has amazing donuts, and amazing cakes, and delicious cookies, which is all true. But sometimes you want your scones to be savory. If that’s the case, then you’ve landed on a gold mine. Order a Jalapeño and cheddar—plus one. 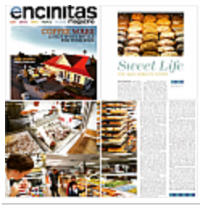 Newspaper Article -- "Doughnut shop not just eatery to customers"
Watch the video to learn more about VG Bakery & Donut.